And it all comes down to this! It’s Sky Striker vs. Trickstar in the Finals as Paulo Roberto Goncalves da Silva vs. Henrique Domingues Nascimento. Both of them are getting a copy of Chaos Emperor, the Dragon of Armageddon, but only one of them will get an Ultra Rare version of the card and only one of them can call themselves a Champion! For the final time this weekend, it’s time to Duel! Goncalves da Silva won the roll and elected to go first. he started with Reinforcement of the Army to add Sky Striker Ace – Raye form his Deck to his hand. He Normal Summoned Sky Striker Ace – Raye and used it to Link Summon Sky Striker Ace – Shizuku. He Set Infinite Impermanence, Twin Twisters and in the End Phase he added Sky Striker Mobilize – Engage! from his Deck to his hand, adding to the other card in his hand, Metalfoes Fusion. Nascimento activated Trickstar Light Stage and Goncalves da Silva chained Twin Twisters, discarding Metalfoes Fusion to destroy the field and prevent the search. But Nascimento had another Trickstar Light Stage ready and activated it to add Trickstar Candina from his Deck to his hand. He activated the effect of the Field Spell to freeze Goncalves da Silva’s Set Infinite Impermanence. Nascimento attempted to Normal Summon Trickstar Candina and use its effect but Goncalves da Silva chained Effect Veiler to negate the effect. Nascimento banished 5 cards from his Extra Deck to Special Summon Eater of Millions. Trickstar Candina crashed into Sky Striker Ace – Shizuku, destroying both, Sky Striker Ace – Raye came out of the Graveyard and Eater of Millions tried to attack if but Sky Striker Ace – Raye Tributed itself to Special Summon Sky Striker Ace – Hayate which was banished by Eater of Millions. In Main Phase 2, Nascimento Set 2 cards and activated Legacy of the Duelist! In the End Phase, Goncalves da Silva sent the Set Infinite Impermanence to the Graveyard. Goncalves da Silva drew Ash Blossom & Joyous Spring. He activated Sky Striker Mobilize – Engage! but Nascimento Chained Shared Ride forcing Goncalves da Silva to Chain Ash Blossom & Joyous Spring. Goncalves da Silva added Sky Striker Mecha – Hornet Drones from his Deck to his hand and drew a card. Goncalves da Silva then sent the Metalfoes Fusion in his Graveyard back to his Deck to draw another Ash Blossom & Joyous Spring. He activated Sky Striker Mecha – Hornet Drones to Special Summon a Token which was used to Link Summon Sky Striker Ace – Kagari whose effect let Goncalves da Silva add Sky Striker Mobilize – Engage! back to his hand. Goncalves da Silva took another read at Legacy of the Duelist before activating Sky Striker Mobilize – Engage! to add Sky Striker Maneuver – Afterburners! from his Deck to his hand and draw Terraforming. Goncalves da Silva activated Sky Striker Maneuver – Afterburners! targeting Eater of Millions and Nascimento chained Scapegoat. Goncalves da Silva destroyed Eater of Millions and Legacy of the Duelist. Next, Terraforming was activated to add Sky Striker Airspace – Area Zero from his Deck to his hand. Area Zero was activated and its effect targeting Sky Striker Ace – Kagari, letting Goncalves da Silva add Sky Striker Mecha – Widow Anchor from his Deck to his hand, sending Sky Striker Ace – Kagari to the Graveyard which allowed Sky Striker Ace – Raye to jump out of the Graveyard. Sky Striker Ace – Raye attacked a Token, then Sky Striker Ace – Raye was Tributed to Special Summon Sky Striker Ace – Hayate. It attacked another Token, then in Mai Phase 2, Shizuku came in. In the End Phase, Shizuku’s effect added Sky Striker Mecha Modules – Multirole form his Deck to his hand. Nascimento used a Token to Link Summon Linkuriboh. Next, he Set a card to the back and passed. Goncalves da Silva drew Infinite Impermanence. Sky Striker Ace – Shizuku swapped out for Sky Striker Ace – Kagari whose effect added Sky Striker Maneuver – Afterburners! from his Graveyard to his hand. Sky Striker Mecha Modules – Multirole was activated, then he used Sky Striker Mecha Modules – Multirole’s effect targeting Sky Striker Airspace – Area Zero. Nascimento chained Imperial Order. Goncalves da Silva went into the tank and chained Sky Striker Mecha – Widow Anchor to take control of Linkuriboh. 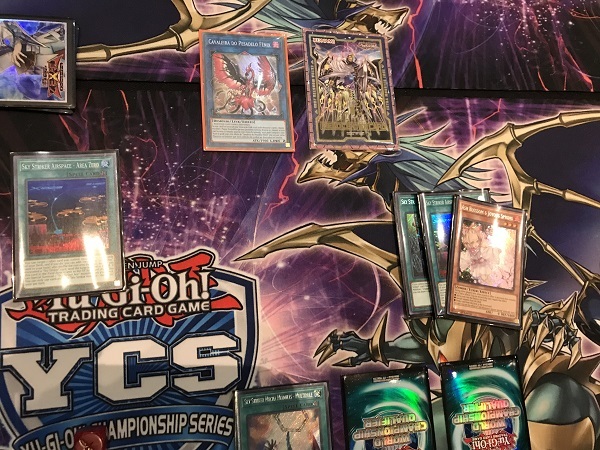 The stolen Linkuriboh attacked the final Sheep Token and Sky Striker Ace – Kagari connected directly, leaving Nascimento at 5800 LP. In Main Phase 2, Linkuriboh and Sky Striker Ace – Kagari were used to Link Summon Knightmare Phoenix. Its effect let Goncalves da Silva discard Sky Striker Maneuver – Afterburners! to destroy Nascimento’s Imperial Order. Sky Striker Airspace – Area Zero’s effect was used next, targeting Knightmare Phoenix, revealing no Sky Striker cards. He Set Infinite Impermanence and in the End Phase he used Sky Striker Mecha Modules – Multirole’s effect to Set Sky Striker Mecha – Widow Anchor from his Graveyard back to the field. Nascimento used Trickstar Light Stage’s effect to freeze the face-down he knew was Sky Striker Mecha – Widow Anchor and Goncalves da Silva Chained it onto his own Knightmare Phoenix. In the End Phase, Goncalves da Silva used Sky Striker Mecha Modules – Multirole’s effect to Set Sky Striker Mobilize – Engage! from the Graveyard back to the field. Goncalves da Silva drew Metalfoes Fusion. He activated Sky Striker Airspace – Area Zero on Knightmare Phoenix, revealing Sky Striker Mobilize – Engage! and 2 other cards. 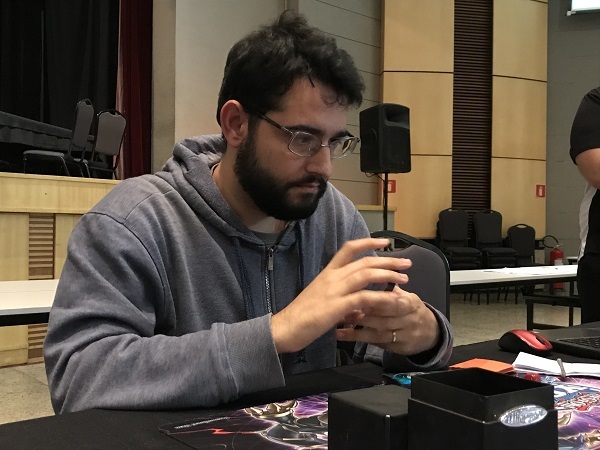 Nascimento conceded the game and Goncalves da Silva was one win away from a YCS Championship! Nascimento elected to go first. He started with Pot of Desires, banishing the top 10 cards of his Deck to draw 2 cards. Trickstar Light Stage came down next and he added Trickstar Candina from his Deck to his hand. Trickstar Candina was Normal Summoned and Nascimento tried to use the effect. Goncalves da Silva chained Effect Veiler from his hand but Nascimento forced the effect through with a chained Called by the Grave from his hand banishing Goncalves da Silva’s Effect Veiler! The effect resolved and Nascimento added Trickstar Reincarnation to his hand. Goncalves da Silva drew and Nascimento activated Rivalry of Warlords, putting Goncalves da Silva in a tough spot right away. Goncalves da Silva activated Sky Striker Mecha Modules – Multirole, taking 400 damage from Candina and Light Stage. Next, he activated Terraforming, adding Sky Striker Airspace – Area Zero from his Deck to his hand and taking another 400 damage. Nascimento elected to use Trickstar Reincarnation here and Chain Droll & Lock Bird. Uh oh. Goncalves da Silva chained Sky Striker Mecha – Eagle Booster and Sky Striker Mecha – Widow Anchor on Candina, banishing the remaining 2 cards in his hand, Metalfoes Fusion and Sky Striker Airspace – Area Zero. In the End Phase, Goncalves da Silva elected to not use Multirole’s effect. Nascimento attacked directly with Trickstar Candina for 2000 damage, leaving Goncalves da Silva at 5200 LP. Goncalves da Silva drew Effect Veiler, not helpful here. He Set it and passed. Nascimento drew to 2 cards in hand. Candina attacked and destroyed Goncalves da Silva’s Effect Veiler. Nascimento Set a card to the back and passed. Goncalves da Silva drew Mystical Space Typhoon and passed. Nascimento attacked directly with Trickstar Candina once again, leaving Goncalves da Silva at 3200 LP. Goncalves da Silva drew Terraforming, adding Sky Striker Airspace – Area Zero to his hand but taking another 400 damage, down to 2800 LP. He activated Sky Striker Airspace – Area Zero, down to 2400. He used Sky Striker Mecha Modules – Multirole on the Field Spell, then used Sky Striker Airspace – Sky Striker Airspace – Area Zero’s effect to Special Summon Sky Striker Ace – Raye from the Deck. He then activated Mystical Space Typhoon to destroy Nascimento’s Rivalry of Warlords but Nascimento tried to chain Solemn Judgment but couldn’t because of Sky Striker Mecha Modules – Multirole’s effect. Goncalves da Silva was down to 2000 LP but could at least use his Extra Deck monsters now. Sky Striker Ace – Raye’s effect was used to Special Summon Sky Striker Ace – Kagari. He used the effect to target Sky Striker Mecha – Widow Anchor in his Graveyard but Nascimento chained Shared Ride to draw a card. Nascimento activated Trickstar Reincarnation to make Goncalves da Silva banish it and draw Ash Blossom & Joyous Spring. In the End Phase, Nascimento used Twin Twisters to destroy Sky Striker Mecha Modules – Multirole. Nascimento switched Trickstar Candina to Defense Position, Set a backrow and passed. Goncalves da Silva drew Twin Twisters, he activated it into the 2 sets but Goncalves da Silva chained Imperial Order. This will put Nascimento on a clock. Sky Striker Ace – Kagari attacked and destroyed Trickstar Candina. He made no other plays with the Sky Striker Ace – Kagari knowing that Nascimento’s last Set was Solemn Judgment. Nascimento Normal Summoned Droll & Lock Bird then used Trickstar Reincarnation in the Graveyard to bring back Trickstar Candina. Both monsters were used to Link Summon Knightmare Cerberus. He used another Trickstar Reincarnation for Trickstar Candina once again, then used both monsters for Knightmare Unicorn. Nascimento used its effect, discarding Called by the Grave to spin Sky Striker Ace – Kagari back to Goncalves da Silva’s Extra Deck. Sky Striker Ace – Raye’s effect brought her back from the Graveyard to the field. Nascimento used the last Trickstar Reincarnation in his Graveyard to bring back Trickstar Candina again. Knightmare Unicorn attacked into Sky Striker Ace – Raye and Goncalves da Silva used the effect, Tributing it to Special Summon Sky Striker Ace – Shizuku which was destroyed in battle. Trickstar Candina was the last attack and that’s all that was needed to force the third and final Duel of the tournament! Whoever wins this next one will be the YCS São Paulo Champion! Goncalves da Silva elected to go first. He started with Upstart Goblin to draw a card and give Nascimento 1000 LP. Sky Striker Ace – Raye was Normal Summoned which turned into Sky Striker Ace – Hayate. Sky Striker Mecha Modules – Multirole was activated, followed by 2 set Sky Striker Mecha – Widow Anchors. Nascimento activated Pot of Desires but Goncalves da Silva negated it with Ash Blossom & Joyous Spring! Trickstar Lycoris was Normal Summoned and attacked into Sky Striker Ace – Hayate. Nascimento activated Called by the Grave during the battle to banish Goncalves da Silva’s Sky Striker Ace – Raye in the Graveyard preventing it from coming back to the field. In damage calculation, Goncalves da Silva used Sky Striker Ace – Hayate’s effect to send Sky Striker Mobilize – Engage! from his Deck to the Graveyard. Nascimento Set a card and passed. In the End Phase, Goncalves da Silva activated Sky Striker Mecha – Widow Anchor on Trickstar Lycoris and then used Sky Striker Mecha Modules – Multirole to Set Sky Striker Mobilize – Engage! back to the field. Goncalves da Silva drew Sky Striker Maneuver – Afterburners!. He Set it then activated Sky Striker Mobilize – Engage! which Nascimento negated with Ash Blossom & Joyous Spring. He activated the Set Sky Striker Maneuver – Afterburners! to destroy Nascimento’s Trickstar Lycoris. In the End Phase, he used Sky Striker Mecha Modules – Multirole to Set Sky Striker Mecha – Widow Anchor and Sky Striker Maneuver – Afterburners!. Goncalves da Silva drew Mystical Space Typhoon and Set it. Nascimento activated Twin Twisters, destroying Goncalves da Silva’s Set Sky Striker Mecha – Widow Anchor and Sky Striker Maneuver – Afterburners!. Nascimento then used Trickstar Reincarnation to Special Summon Trickstar Lycoris form the Graveyard. Goncalves da Silva drew Effect Veiler. Nascimento attacked with Trickstar Lycoris, leaving Goncalves da Silva at 4300 LP. Nascimento Set a card and Goncalves da Silva blasted it with Mystical Space Typhoon in the End Phase: Solemn Judgment. Goncalves da Silva drew Droll & Lock Bird. He Set it and passed. Nascimento attacked with Trickstar Lycoris and destroyed the Set Droll & Lock Bird. Goncalves da Silva drew and activated Reinforcement of the Army but Nascimento chained Shared Ride. Goncalves da Silva added Sky Striker Ace – Raye to his hand. 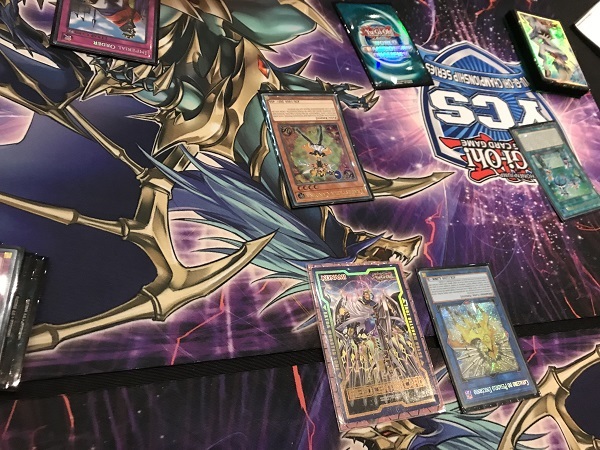 After the chain resolved, Nascimento activated Trickstar Reincarnation forcing Goncalves da Silva to banish Sky Striker Ace – Raye and Effect Veiler, drawing another Effect Veiler and Terraforming. 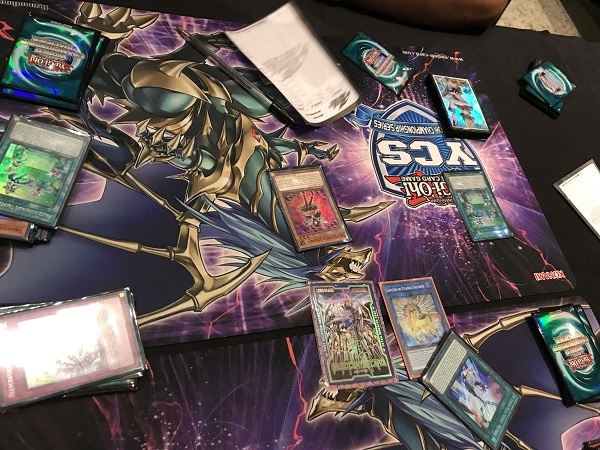 Goncalves da Silva was down to 3300 LP facing a Trickstar Lycoris that was going to chip away at his LP with less than 10 minutes left in the Round. Goncalves da Silva went for it and activated Terraforming, adding Sky Striker Airspace – Area Zero to his hand and going down to 3100. 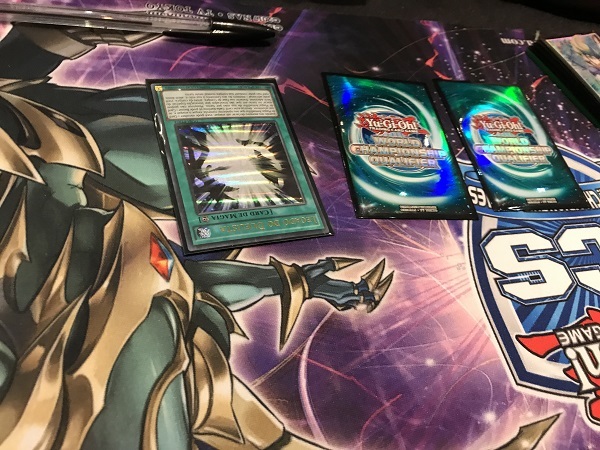 Sky Striker Airspace – Area Zero was next and he used Sky Striker Mecha Modules – Multirole’s effect on the Field Spell, letting him Special Summon Sky Striker Ace – Raye from the Deck. Sky Striker Ace – Raye was sent to the Graveyard to Link Summon Sky Striker Ace – Shizuku. It attacked and destroyed Trickstar Lycoris, leaving Nascimento at 8200 LP. In the End Phase, Goncalves da Silva used Sky Striker Mecha Modules – Multirole to Set Sky Striker Airspace – Area Zero form The Graveyard. Nascimento activated Twin Twisters, discarding Ash Blossom & Joyous Spring to destroy Goncalves da Silva’s Sky Striker Mecha Modules – Multirole and Sky Striker Mecha – Widow Anchor. He activated Trickstar Light Stage and used its effect to add Trickstar Candina from the Deck to the Graveyard. He Normal Summoned it but the effect was negated by Effect Veiler. Trickstar Candina crashed into Shizuku. Goncalves da Silva drew Droll & Lock Bird. He activated the Set Sky Striker Airspace – Area Zero then sent Shizuku to the Graveyard to Link Summon Sky Striker Ace – Hayate who attacked and whose effect let Goncalves da Silva send Sky Striker Mobilize – Engage! from the Deck to the Graveyard. In Main Phase 2, Sky Striker Ace – Hayate went away for Sky Striker Ace – Kagari whose effect let Goncalves da Silva pick up Sky Striker Mobilize – Engage! which added Sky Striker Mecha – Widow Anchor from his Deck to his hand and drew Effect Veiler. Sky Striker Ace – Kagari came out for Sky Striker Ace – Shizuku. In the End Phase, he used Sky Striker Ace – Shizuku’s effect to add Sky Striker Mecha – Shark Cannon from his Deck to his hand. Nascimento drew, Set a card and passed. Goncalves da Silva drew Metalfoes Fusion. He Set it, used the Area Zero’s effect to add another Sky Striker Airspace – Area Zero from his Deck to his hand and send Metalfoes Fusion to the Graveyard. He used the effect of Metalfoes Fusion, putting it back into the Deck to draw another Sky Striker Airspace – Area Zero. Shizuku came out for Sky Striker Ace – Kagari but the Summon was negated by Solemn Warning. He Set Sky Striker Mecha – Widow Anchor and Sky Striker Mecha – Shark Cannon. Nascimento used Trickstar Light Stage to freeze one of Goncalves da Silva’s face-downs. Nascimento then used Terraforming for Trickstar Light Stage but Goncalves da Silva activated Droll & Lock Bird to stop further searching this turn. Nascimento used Trickstar Reincarnation from his Graveyard to Special Summon Trickstar Candina. He attacked directly with it but Goncalves da Silva activated Sky Striker Mecha – Widow Anchor to steal Candina just trying to save LP so close to time. He passed it back in the End Phase, then used Sky Striker Mecha – Shark Cannon to Special Summon Trickstar Lycoris from Nascimento’s Graveyard. Goncalves da Silva drew Mystical Space Typhoon. He activated Area Zero’s effect on Lycoris but didn’t hit any Sky Striker. He then activated Mystical Space Typhoon on his own Sky Striker Airspace – Area Zero to Special Summon Sky Striker Ace – Raye from the Deck. But there were no Sky Striker Ace – Rayes left in the Deck to Summon! Having to switch gears quickly, he Normal Summoned Effect Veiler and used the monsters to Link Summon Knightmare Phoenix and attacked into Nascimento’s Trickstar Candina. With no Rayes left to Summon and no easy way to get to a Sky Striker Link Monster, Goncalves da Silva needed to ride this Knightmare Phoenix to victory. Nascimento activated Trickstar Light Stage and added Trickstar Lilybell which was Normal Summoned. Lilybell attacked directly. Lilybell’s effect let Trickstar Lycoris come back to Nascimento’s hand from the Graveyard and Lycoris’s effect was activated to swap places with Lilybell. Then Lilybell’s effect let her come back to the field and attack again, leaving Goncalves da Silva at a dangerous 500 LP. Goncalves da Silva drew Ash Blossom & Joyous Spring with Lycoris and Light Stage putting Goncalves da Silva down to just 100 LP. He Normal Summoned Ash Blossom & Joyous Spring, then used Knightmare Phoenix and Ash Blossom & Joyous Spring to Link Summon Knightmare Unicorn, discarding Sky Striker Airspace – Area Zero to spin Trickstar Lycoris and attacked over Trickstar Lilybell. He’s in control of the field again but in dire straits. One Trickstar effect will end this. … and Nascimento found it with another Trickstar Light Stage that was activated to add Trickstar Lycoris from his Deck to his hand. He Normal Summoned it with Goncalves da Silva at 100 LP. Goncalves da Silva drew for his turn and Trickstar Lycoris took the rest of his LP! 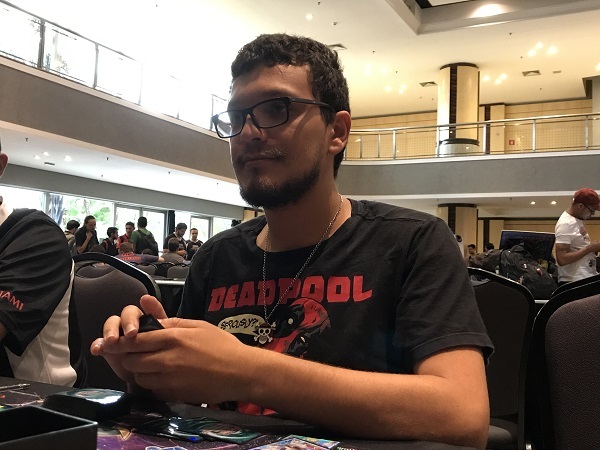 It comes down to the wire but Henrique Domingues Nascimento is your YCS São Paulo Champion!